Take a Break is considered to be the respected voice of ordinary people with over 3.2 million readers each week. This weekly magazine is packed with essential news, information and features that are worth reading. The magazine is dedicated for all people of all ages. There is something for everyone. It includes excellent features, fascinating competitions and puzzles, sections dedicated for health and relationships, fashion and beauty, cookery and much more. Take a Break Magazine comes with something for everyone. It is a family friendly magazine where you can find the real world for adults, fascinating competitions and puzzles for children, health and beauty for youngsters etc. One of the most important features of this magazine is the fascinating competitions and puzzles. The magazine offers fabulous prizes for the winners. Another popular feature of Take a Break Magazine is the section dedicated to health and relationship advice. In this section you will get expert advice and top tips about health and relationships. The readers get an opportunity to ask their queries relating their relationships and health. The magazine gives you accurate and reliable answers. Each issue of Take a Break comes with a section dedicated for fashion and beauty. This magazine also includes latest fashion trends, beauty tips, seasonal beauty cure and lots more. If you need to get some mouthwatering recipes then Take a Break is an ideal choice. According to a recent survey it is calculated that around 3.2 m women read this magazine. I miss the short story's that it used to have..
Like the quizzes , but miss the sudoku which used to be included. Got subscription for my mums birthday and she loves the crosswords as aswell as all the stories. When she has finished with the magazine she passes it to me to read !! Have had to ring a couple of times for missing issues . I love entering competitions and also find take a break a nice easy magazine to read! I have been buying this magazine for my mother which she thoroughly enjoys, she waits for it coming in the post every week. fantastic quality magazine, good quality for money , love the storys and puzzles. I really enjoy the Real-life stories of challenges and hardships. Very entertaining magazine! Ordered for my mum who looks forward to receiving this magazine directly to her home address every week. Great service for my Mother who loves puzzles and quizzes. To have it delivered every week is a real treat for her. Love the puzzles and stories. Take A Break is love, Take a Break is life. THIS IS THE THIRD YEAR I HAVE DONE THIS FOR MY MUM AND SHE SEEMS TO BE VERY HAPPY WITH IT. Its my favourite magazine. It contains a wide variety of stories as well as competitions. Its great. Love the easy online competition entry. I like the range of puzzles and the chance to be a winner. Great magazine, full of brilliant competitions and a lot of true stories. I like the puzzle range from quite hard to nice and easy and the stories are very thought provoking. I love this magazine. i love the stories and the puzzles. It's the only magazine that I have found that I can enjoy from cover to cover. My elderly mother really enjoys the competitions and puzzles. Great stories and fab puzzles. Sorry, I can't comment as I bought a subscription for my mother, but she loves your magazine. I enjoy Take a Break and love the puzzles, I would like more puzzles and fewer stories. Sadly this magazine has only bin delivered once despite my calling to complain I am still trying to call to complain again! love mag and enjoy the reading and the competitions. I really enjoy the editions, as they are free from silly celebrities. Most people in my age group want some stories, not manufactured nonsense. very pleased with the magazine, I like doing the puzzles, stories are interesting. I have bought this magazine for many years I don't know what I would do without it now. I love doing puzzles they keep my brain alive. I also love the stories some of which are so sad but many end happily. 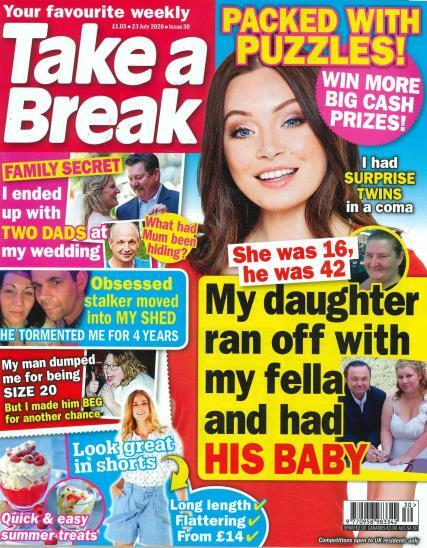 My week is not complete without my Take a break!Its the best magazine you can buy.All the stories, great tips and competitions, well worth 82p of anyone's money! Tired and weary! Muscles ache! Time to sit down with my ‘Take a Break’. Real life stories, puzzles galore, problem pages and so much more... Win some prizes; cook some grub or learn how to reuse an old butter tub. Whatever your mood and whatever your scene, your sure to love this great magazine. Take a Break is a magazine for those who don't want to have to think in any depth about a subject, but like true life stories. The stories invariably involve someone losing weight, ditching their fiance (or being ditched) at the altar and going off with the vicar, or having a child who gets sick and dies. The stories involving the children invariably affect me and I end up crying. The others tend to be somewhat predictable. You do wonder about the 60 year olds who think that a handsome 25 year old from a 3rd world country is genuinely interested in them (rather than their money) and then turn out to be surprised (and turn to Take A Break) when the said 25 year old fleeces them of their live savings, and turns out to have a local wife and kids on the side. The hints and tips by readers are excellent and have proved to be very useful, and the recipe section is invariably very good as well. As soon as we get the magazine my two year old turns to the food pages and says loudly "yum, yum". The magazine is an enjoyable read for a busy mum of two, but needs a little more variety and a few less children dying to make it a great magazine. This is a great magazine simply for the competitions available. There are plenty and a good variety. I try to avoid the real life stories though as they can be a little depressing!! I read Take a Break, it is nice to put my feet up with a cuppa and a couple of biscuits and literally take a break, I like the competions, and have a laugh at the funny items, and it is also nice to find some of my worries are nothing compared to others. I like Take a Break magazine. It has a bit of everything including, puzzles, advice, fashion, and true life stories which,to be honest makes me appreciate my own life. It also gives easy to follow recipes. I like the way it is set out, and love to have a go at the puzzles whilst having a tea break. It also gives advice on medical problems which I find very informative. This magazine has something for every age group and taste. From the real life articles featuring people we all know and can relate to. The funny readers pictures. Fabulous puzzles and competitions and lastly readers tips. How could you not love this publication? Every time I read it I find myself saying to friends and family 'Did you read about this story in Take A break?' or sharing a money saving tip. When you take a break and pick this up, you can't put it down until you've read it cover to cover!!! Recommend it to everyone. Each issue is a glossy array of vibrant coloured pictures, fun, mind teasing puzzles and cleverly written stories designed to pull on your emotions and keep you reading till the very end. You can also find out whats going to happen in your imminent future through the weekly horoscope and have a giggle at the antics of readers husbands worthy of the Take a Break stocks! There are plenty of good prizes to be won which can be entered online, via text, over the phone and by good old fashioned post. You are also welcome to submit your letters and photos for the readers letters, each letter published is worthy of a £10 payment and the star letter earning a princly £25! Not bad for a few minutes of your time.